Mark Hebden, a British Oceanogarphic Data Centre (BODC) Data Scientist, recently returned from RRS Discovery cruise D376. This is the first cruise for Fluxes Across Sloping Topography of the North East Atlantic (FASTNEt). FASTNEt is a four-year initiative that aims to improve our understanding of the physical and biogeochemical exchange taking place across continental shelf edge margins. From the start, BODC have been working with FASTNEt scientists to ensure the provision of adequate data management. Shelf edge regions mark the gateway between the world's deep oceans and its shallower coastal seas. They link terrestrial, atmospheric and oceanic carbon pools. Shelf margin processes have a direct influence on near-shore productivity (and consequently fisheries) as well as affecting global climate. Traditionally, research cruises have offered a brief opportunity to collect data; we still have only snapshots of marine environments. D376 was notable for its ambitious data collection regime. The combination of traditional sampling techniques coupled with novel autonomous technologies represents a new era in observational oceanography. D376 deployed four gliders at the shelf edge. Gliders are autonomous vehicles that use small changes in their buoyancy to descend and ascend through the water column. 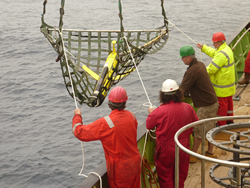 Three of these gliders will be gathering data on and off the Celtic Sea shelf until autumn 2012. Between dives, scientific sensors will collect near-real-time data and transmit them via satellite back to shore. Data Scientist cruise participation strengthens project relationships and increases familiarity with data streams. This has a direct influence on the efficiency of data assimilation to the data centre. While at sea, Mark was responsible for compiling accurate and complete metadata — essential information about data. The cruise also marked another significant milestone, one which nods firmly to the past. With the scientific objectives completed, RRS Discovery set sail for port, arriving on the eve of the 50th anniversary of her launch. Discovery will be taken out of service later this year. Her replacement will take over in 2013. Discovery has played a central role in marine research, from charting the ocean floor, contributing to climate change research and discovering marine species. An important and significant legacy of data, for use long into the future, remains as a fitting testament to 50 years of research.